Back in July of 2017 I reviewed the TOC19 ,which was TOC’s first model. Taking inspiration from the Bauhaus era, they came up with a very stylish, minimalistic, and retro dress watch. Keeping with that same theme, TOC has comes out with a thinner and – in my opinion – more refined model called the TOC Ulysses. Toc was able to send me out one to review so lets check out this latest TOC watch. 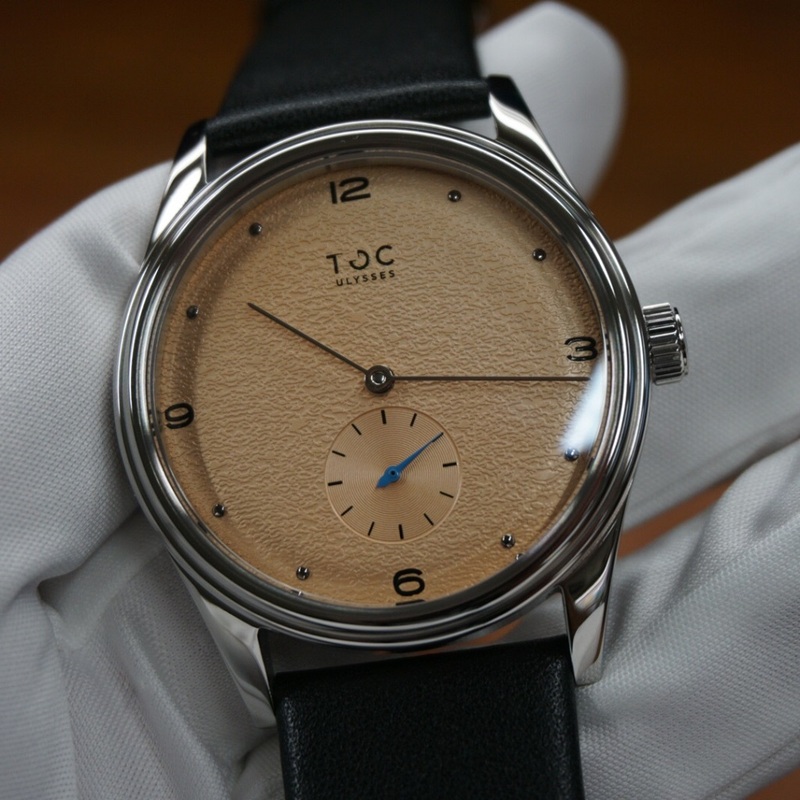 This TOC Ulysses came with the burren gold dial which has a nice textured finish. The polished stick hands – while very thin – stand out sharply against the gold dial. The only contrasting color is from the seconds hand on the sub dial, here done in a blue. There is no lume to be had on the dial, but that’s fine if in the realms of the dressy watch. I also really want to compliment them on their choice of font size for the number on this watch. The finishing on this stainless steel TOC Ulysses is very nice. Lines are simple and clean like you would expect in a dress watch. What you might not expect is the sapphire, front and back. Covering the dial is a subtly-domed sapphire crystal which, at first glance, looks flat. The polished case measures in at a diameter of 40 mm, height at 9.5 mm, and weighing only 65 grams. Water resistance is good to 3atm or approx. 100 feet which is fine when washing your hands and not much more. Powering this TOC Ulysses is the manually-wound Seagull 1700 with a power reserve of 48 hours. I really like the look of the côtes de Genève decoration showing through that exhibition case back. With no rotor moving in the way its nice to see all this little movement ticking away. Keeping with the minimalistic style of this watch the no-nonsense strap is smooth and thin, made of a quite-soft leather. The clasp is about as minimal as you can get while still securing the watch to your wrist. Even though the clasp is so small TOC was still able to fit their TOC logo to the underside of the buckle. I am not normally a dress watch person, but I was pretty impressed with the quality of this watch as well as the simple retro styling. The finishing is very well done from the case to the movement. If you’re into dress watches, this is a great little watch. When this project kicks of on March 6th, pricing will start at $170 for the first 24hour, after which the early bird prices will start at $232.00. You can check this out on Kickstarter. Would I wear it? Not really into dress watches but on occasion I would. What I’d change: Good the way it is. The best thing about it: Clean retro look.